The Emperor's New Groove is an American animated feature film produced by Walt Disney Feature Animation and released by Walt Disney Pictures through Buena Vista Distribution on December 15, 2000. It is the 40th animated feature in the Walt Disney Animated Classics. The Emperor's New Groove is a comedy including adult and child humor. The title refers to the Danish fairy tale The Emperor's New Clothes by Hans Christian Andersen, though the two have little else in common. Produced by Randy Fullmer and directed by Mark Dindal over a six-year production timeline. 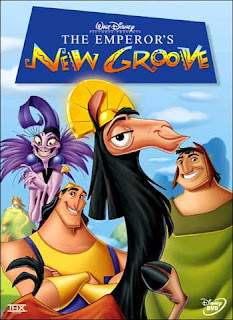 A direct-to-video sequel, Kronk's New Groove, was released in December 2005, followed by an animated television series, The Emperor's New School, in January 2006. 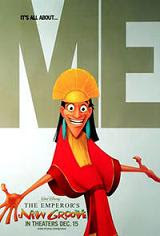 Kuzco (David Spade) is the self-centered teenaged emperor of a mountainous jungle nation. One day, he summons Pacha (John Goodman), the headman of a nearby village, to inform him that he is building his summer home, Kuzcotopia, on the site of Pacha's home. Pacha attempts to protest, and is dismissed. Kuzco's ancient, power-hungry advisor Yzma (Eartha Kitt) and her easily-distracted lackey Kronk (Patrick Warburton) then attempt to poison Kuzco so that she can take control of the empire. 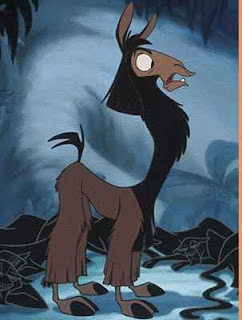 However, the attempt is flawed, as the supposed poison turns out to be a potion which turns Kuzco into a llama. After knocking Kuzco unconscious, Yzma orders Kronk to dispose of him, but conscience-stricken Kronk loses the sack holding Kuzco. 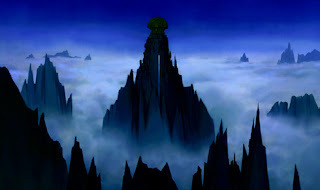 Kuzco ends up in Pacha's village, and after discovering that he has been changed, demands that Pacha help him return to the palace. Rebuffed, Kuzco attempts to return on his own and ends up surrounded by a pack of jaguars, only to be saved when Pacha has a change of heart. 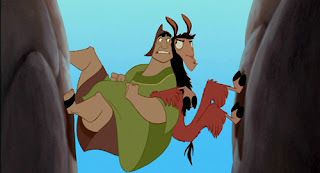 Pacha offers a deal to Kuzco—that he will help Kuzco if Kuzco will build his summer home elsewhere; Kuzco pretends to agree but only truly begins to change after the pair of them must work together to survive the collapse of a rope bridge. Yzma assumes command of the nation, but when Kronk reveals he never killed Kuzco, the two search the jungle for him. Kuzco, Pacha, Yzma, and Kronk finally arrive at the same roadside diner, where Kuzco is glad to see Yzma until he overhears that she is out to kill him. He and Pacha realize the only way to prevent this is to return to Yzma's laboratory and find a potion to return Kuzco to normal. A race between Kuzco, Pacha, Yzma and Kronk begins, with the latter pairing finally getting hit by lightning and falling into a chasm. Kuzco and Pacha arrive at the laboratory but find, inexplicably, that their pursuers somehow got there first. Kronk changes sides after a vicious tongue-lashing from Yzma, and gets dropped down a trapdoor. 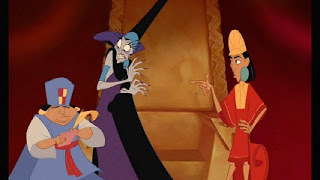 Yzma summons the palace guards, forcing Kuzco and Pacha to grab all of the transformation potions they can and flee. After trying several formulas that convert Kuzco to other animals, and then back to a llama, they escape the guards (but not Yzma) and find they are down to only two vials. Yzma accidentally steps on one of the two, turning herself into a tiny kitten. She still almost manages to obtain the antidote, but is thwarted by the sudden reappearance of Kronk. Kuzco becomes human again and sets out to redeem himself, building instead of Kuzcotopia, a small vacation hut on the hill next to Pacha's home. Meanwhile, outdoorsman Kronk becomes a scout leader, with kitten-Yzma forced to be a member of the troop.